2 Ryan V. Leichsenring, Esq. 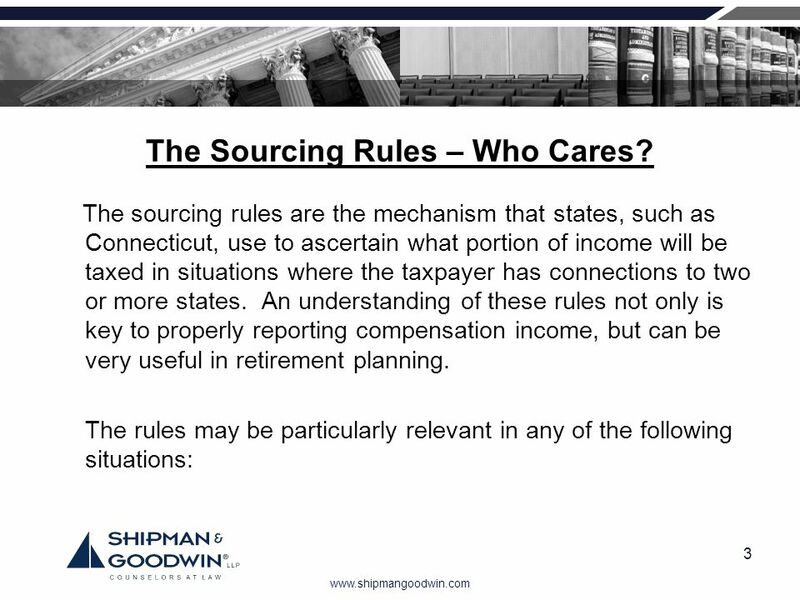 3 The Sourcing Rules – Who Cares? 4 The Sourcing Rules – Who Cares? 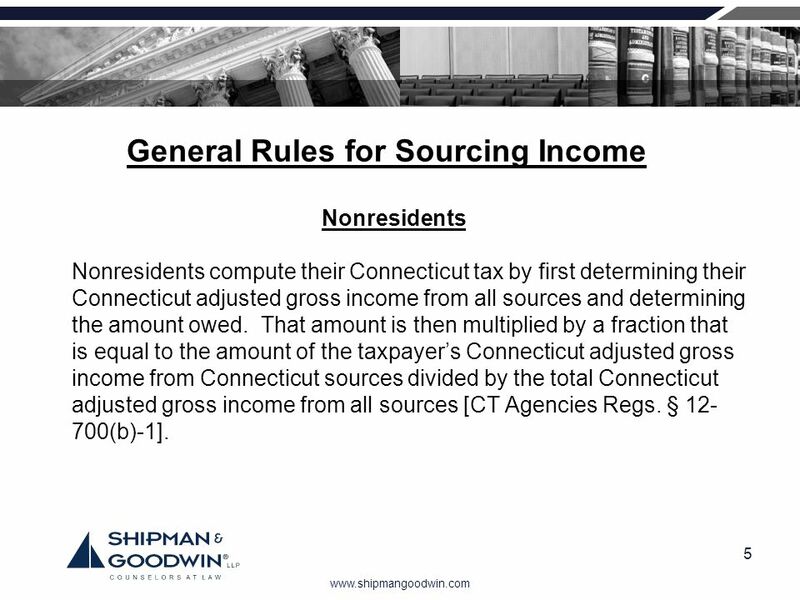 Nonresidents Nonresidents compute their Connecticut tax by first determining their Connecticut adjusted gross income from all sources and determining the amount owed. 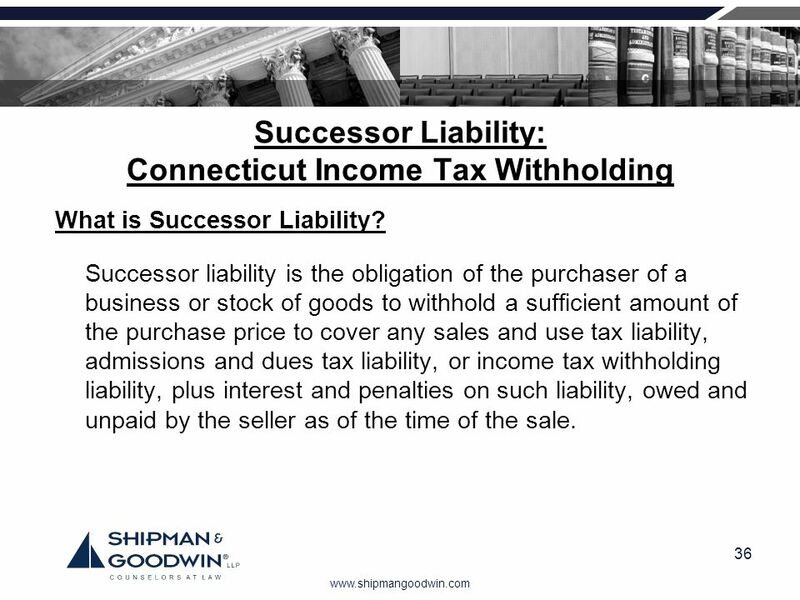 That amount is then multiplied by a fraction that is equal to the amount of the taxpayer’s Connecticut adjusted gross income from Connecticut sources divided by the total Connecticut adjusted gross income from all sources [CT Agencies Regs. § (b)-1]. 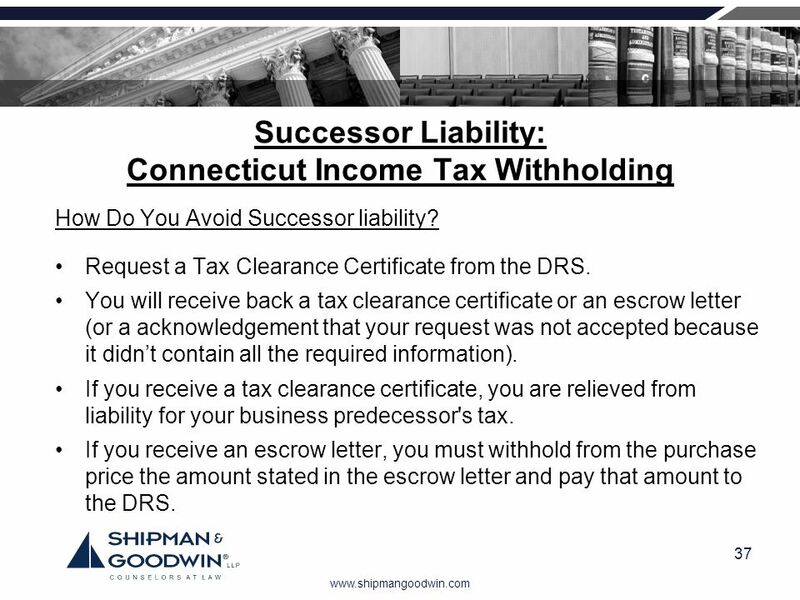 Residents The Connecticut adjusted gross income of residents is federal adjusted gross income with certain modifications (i.e. 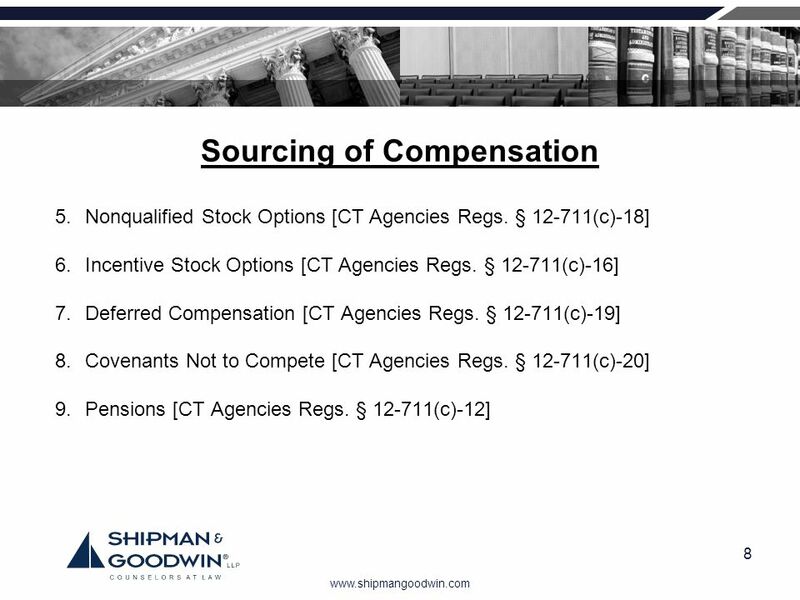 all of your income regardless of source) [CT Agencies Regs. § (a)(20)-1]. 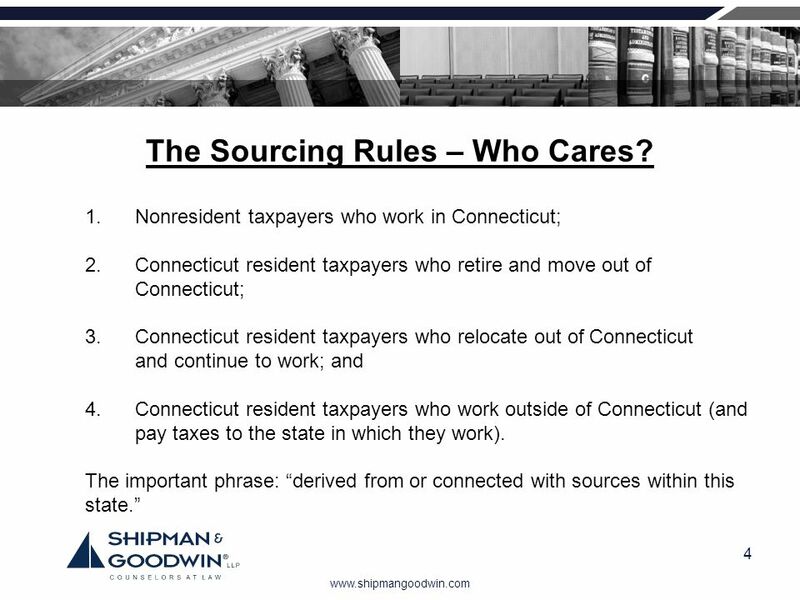 Connecticut adjusts for services provided out of the state by residents by providing a credit for taxes paid to another qualifying jurisdiction [CT Agencies Regs. § (a)-1]. 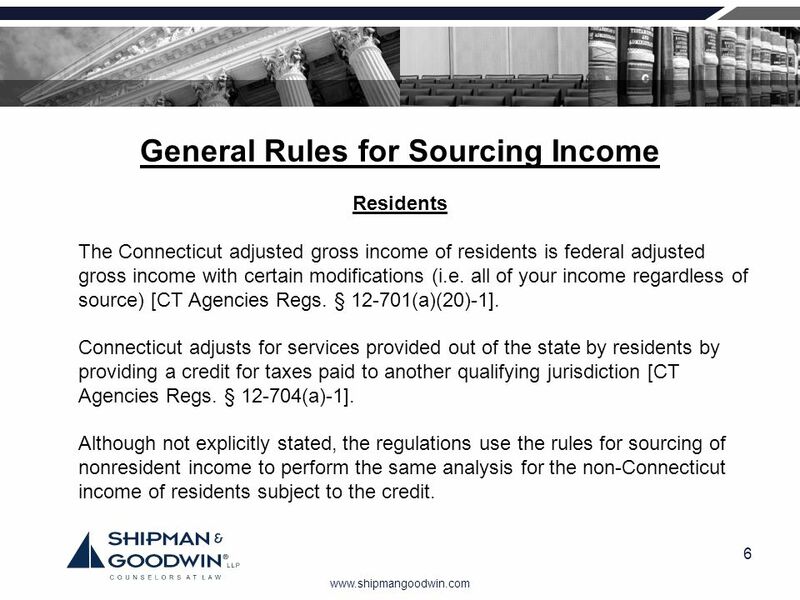 Although not explicitly stated, the regulations use the rules for sourcing of nonresident income to perform the same analysis for the non-Connecticut income of residents subject to the credit. 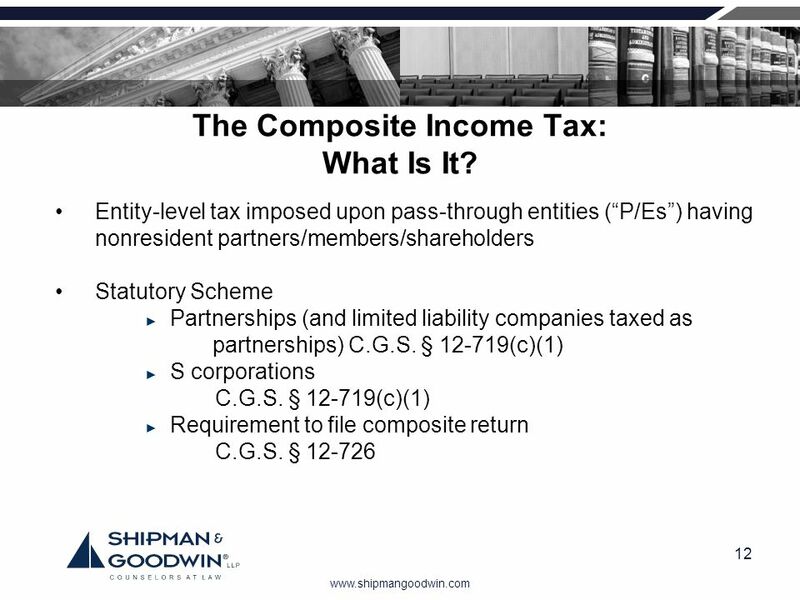 12 The Composite Income Tax: What Is It? C.G.S. 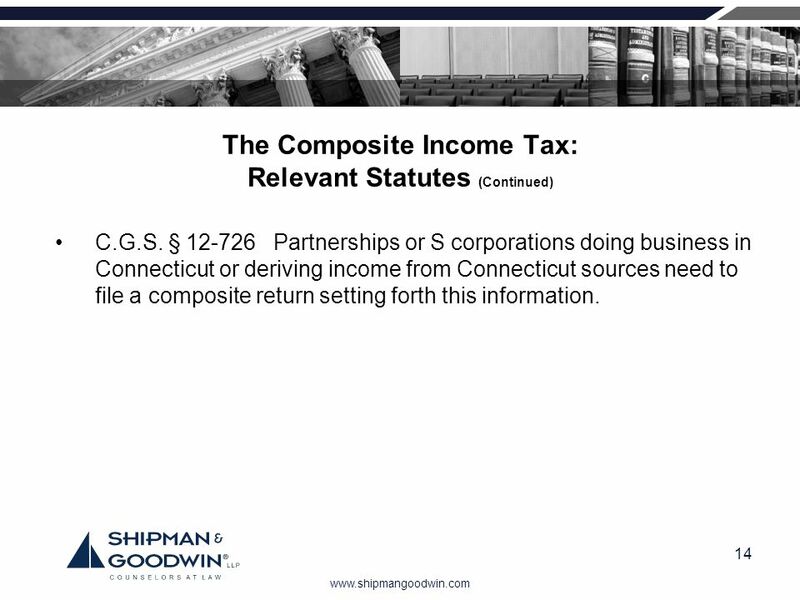 § Partnerships or S corporations doing business in Connecticut or deriving income from Connecticut sources need to file a composite return setting forth this information. P/Es not required to make estimated payments. 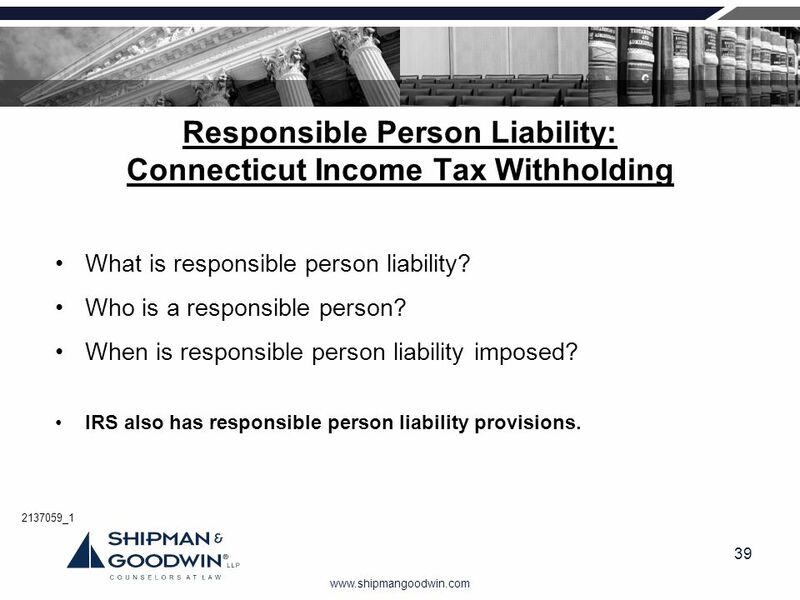 After January 1, 2008, P/Es may NOT rely upon a statement by a member that a Connecticut income tax payment has or will be made by the member for the taxable year. IP 2006(22). 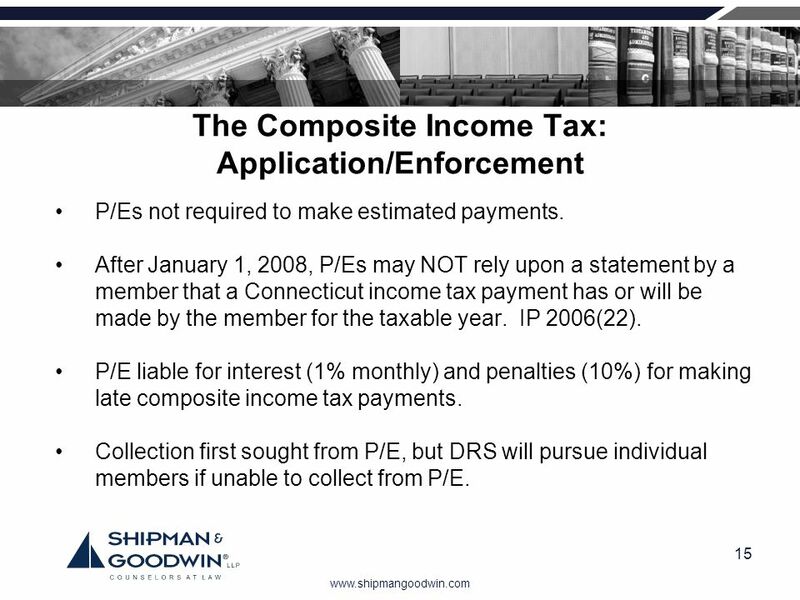 P/E liable for interest (1% monthly) and penalties (10%) for making late composite income tax payments. Collection first sought from P/E, but DRS will pursue individual members if unable to collect from P/E. Determined differently for P/Es than for corporate taxpayers. C.G.S. §§ et seq. 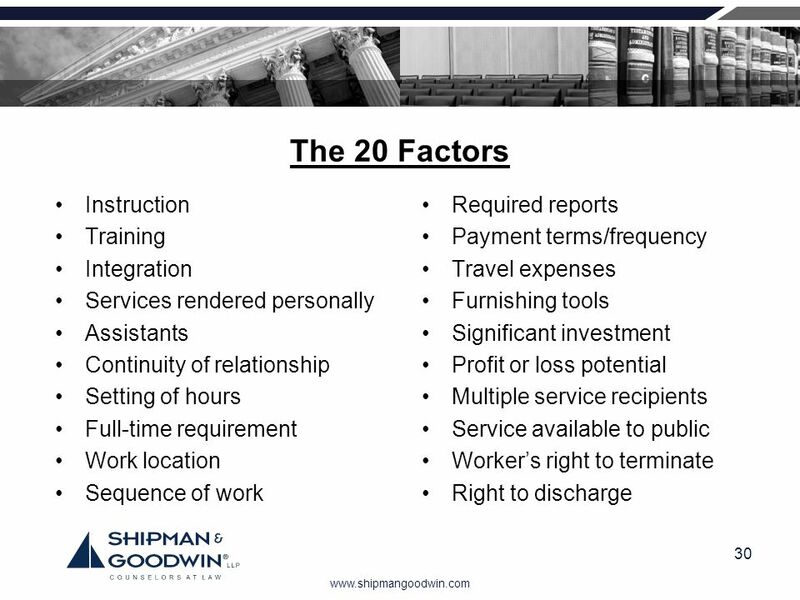 generally requires corporate taxpayers to apportion their income using a three-factor or one-factor formula with sales allocated to a jurisdiction based upon location of the customer. 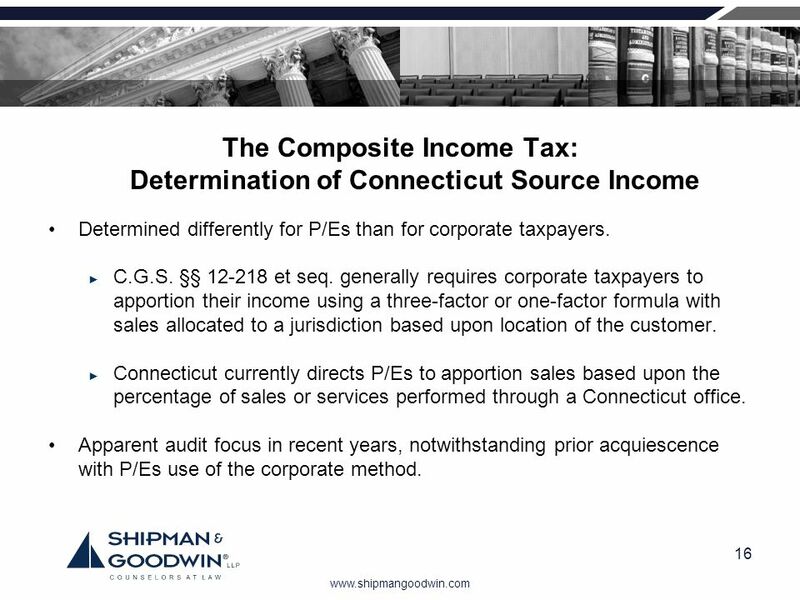 Connecticut currently directs P/Es to apportion sales based upon the percentage of sales or services performed through a Connecticut office. 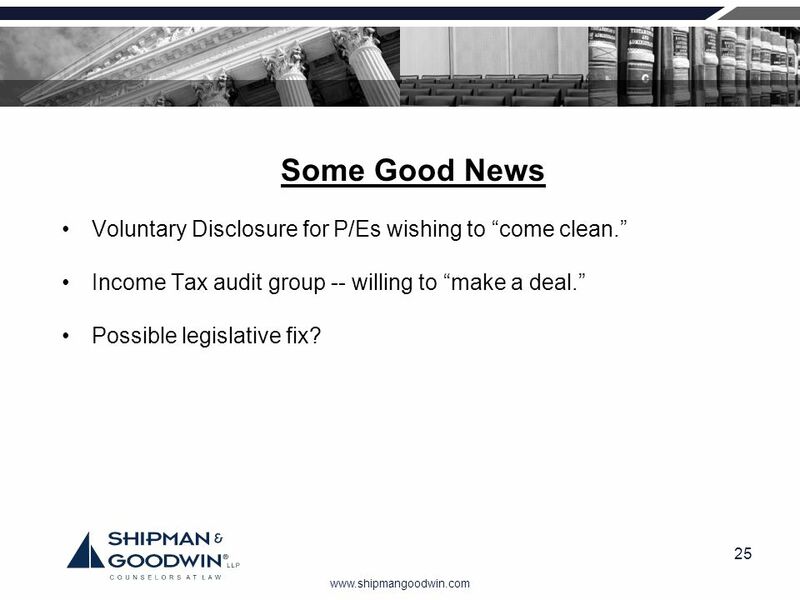 Apparent audit focus in recent years, notwithstanding prior acquiescence with P/Es use of the corporate method. 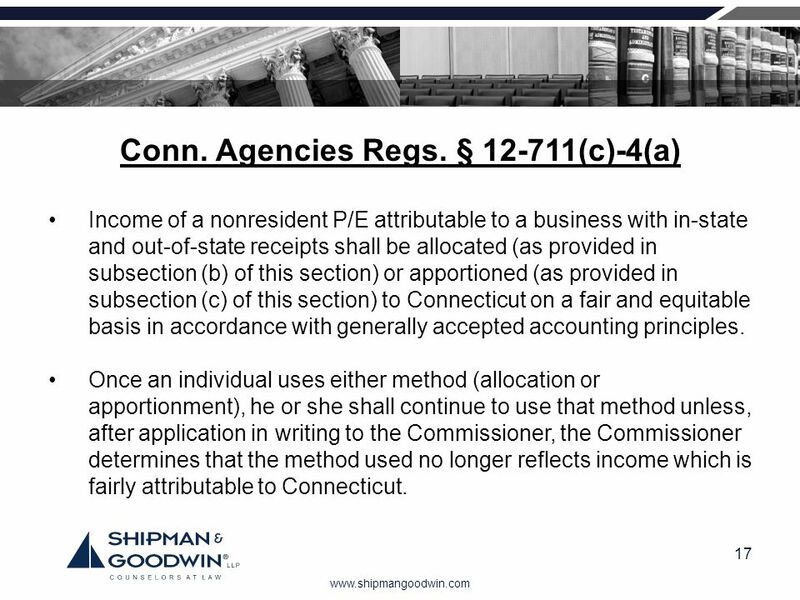 Income of a nonresident P/E attributable to a business with in-state and out-of-state receipts shall be allocated (as provided in subsection (b) of this section) or apportioned (as provided in subsection (c) of this section) to Connecticut on a fair and equitable basis in accordance with generally accepted accounting principles. 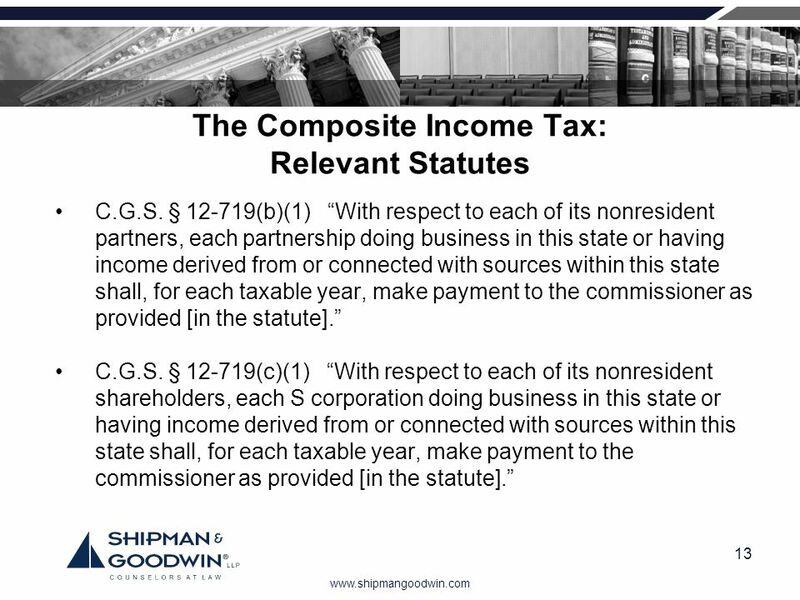 Once an individual uses either method (allocation or apportionment), he or she shall continue to use that method unless, after application in writing to the Commissioner, the Commissioner determines that the method used no longer reflects income which is fairly attributable to Connecticut. 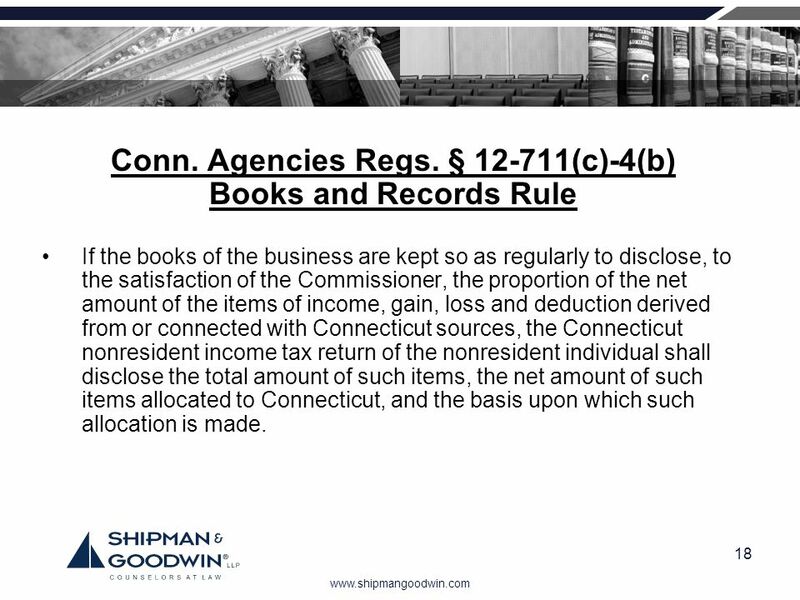 Books and Records Rule If the books of the business are kept so as regularly to disclose, to the satisfaction of the Commissioner, the proportion of the net amount of the items of income, gain, loss and deduction derived from or connected with Connecticut sources, the Connecticut nonresident income tax return of the nonresident individual shall disclose the total amount of such items, the net amount of such items allocated to Connecticut, and the basis upon which such allocation is made. 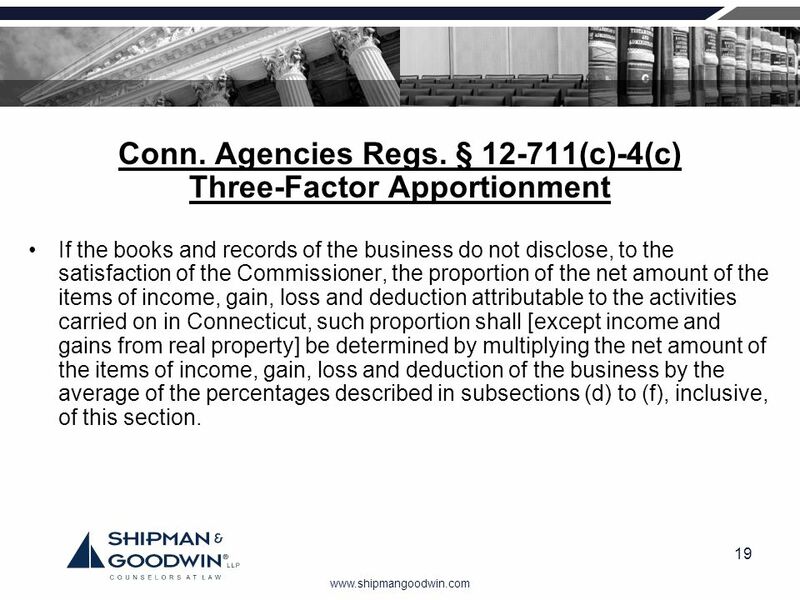 If the books and records of the business do not disclose, to the satisfaction of the Commissioner, the proportion of the net amount of the items of income, gain, loss and deduction attributable to the activities carried on in Connecticut, such proportion shall [except income and gains from real property] be determined by multiplying the net amount of the items of income, gain, loss and deduction of the business by the average of the percentages described in subsections (d) to (f), inclusive, of this section. 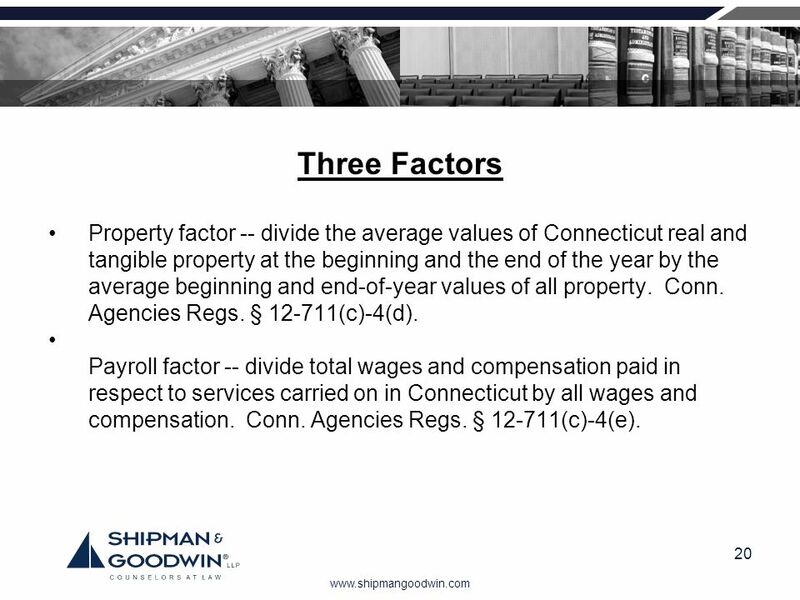 20 Three Factors Property factor -- divide the average values of Connecticut real and tangible property at the beginning and the end of the year by the average beginning and end-of-year values of all property. Conn. Agencies Regs. § (c)-4(d). 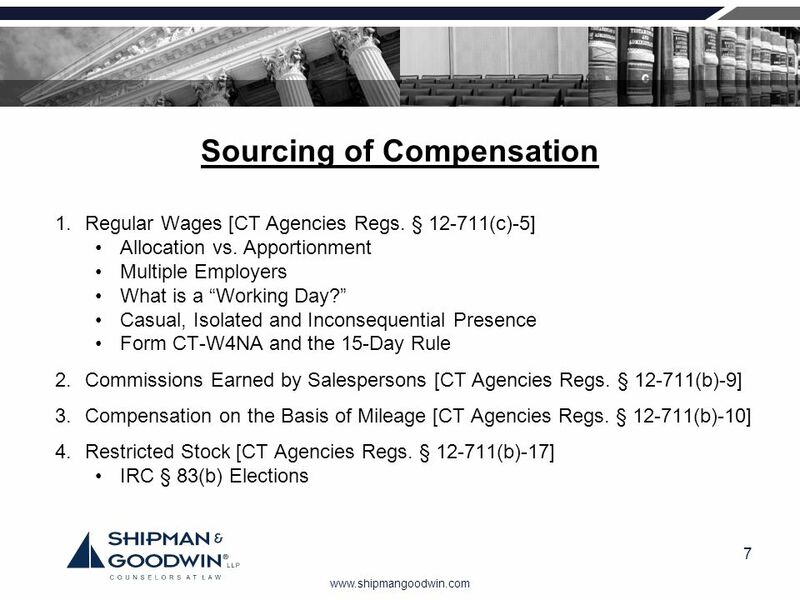 Payroll factor -- divide total wages and compensation paid in respect to services carried on in Connecticut by all wages and compensation. Conn. Agencies Regs. § (c)-4(e). 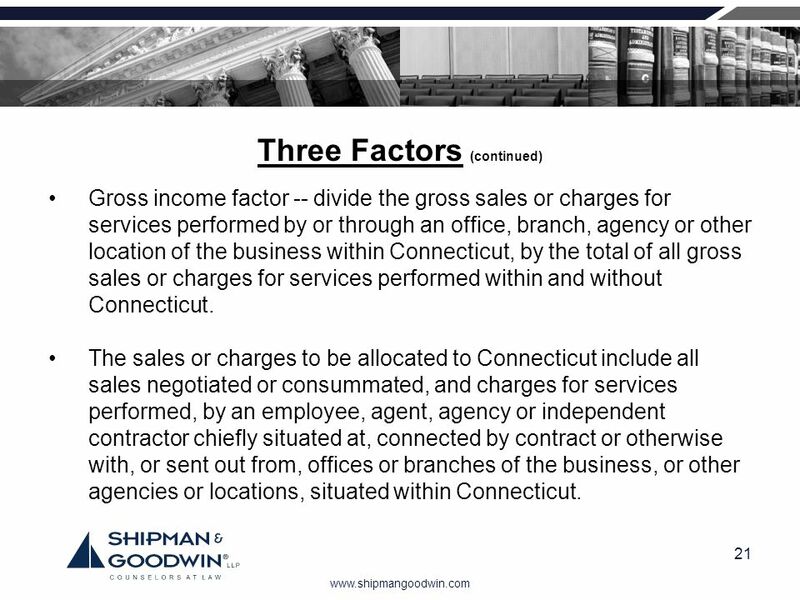 Gross income factor -- divide the gross sales or charges for services performed by or through an office, branch, agency or other location of the business within Connecticut, by the total of all gross sales or charges for services performed within and without Connecticut. 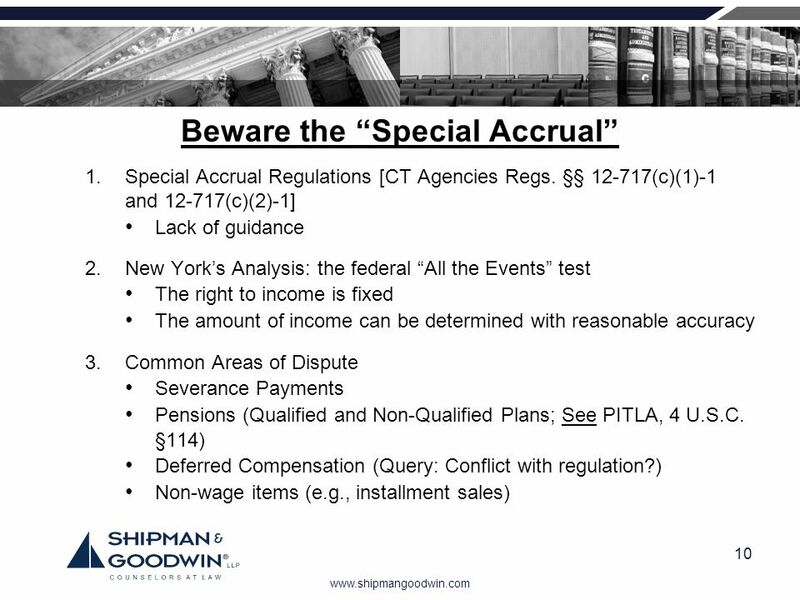 The sales or charges to be allocated to Connecticut include all sales negotiated or consummated, and charges for services performed, by an employee, agent, agency or independent contractor chiefly situated at, connected by contract or otherwise with, or sent out from, offices or branches of the business, or other agencies or locations, situated within Connecticut. 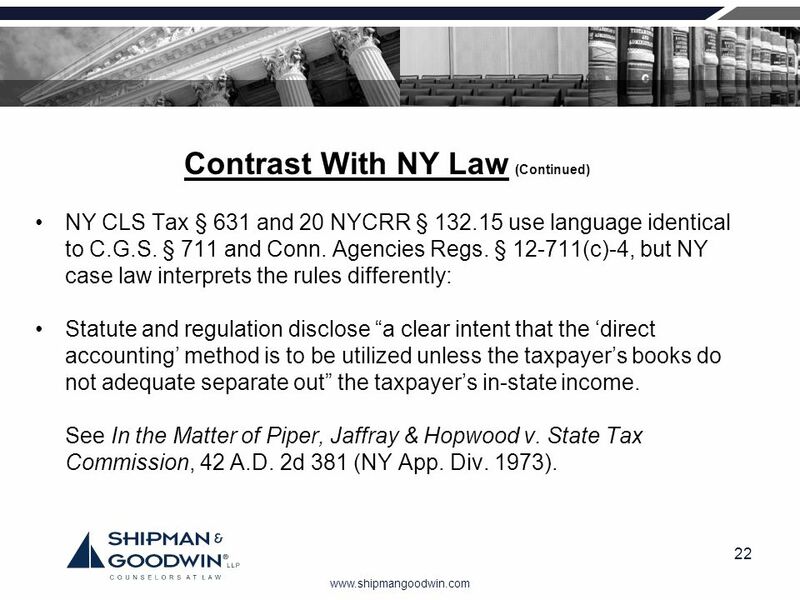 NY CLS Tax § 631 and 20 NYCRR § use language identical to C.G.S. § 711 and Conn. Agencies Regs. 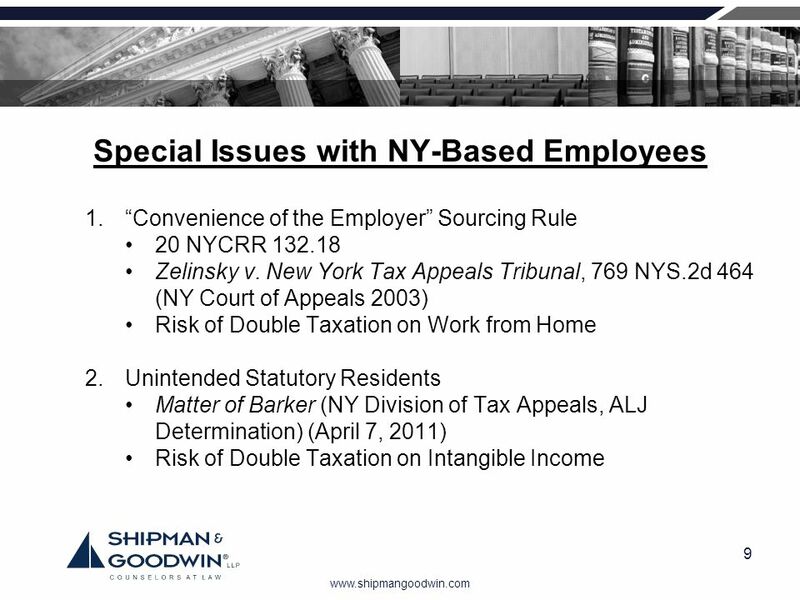 § (c)-4, but NY case law interprets the rules differently: Statute and regulation disclose “a clear intent that the ‘direct accounting’ method is to be utilized unless the taxpayer’s books do not adequate separate out” the taxpayer’s in-state income. 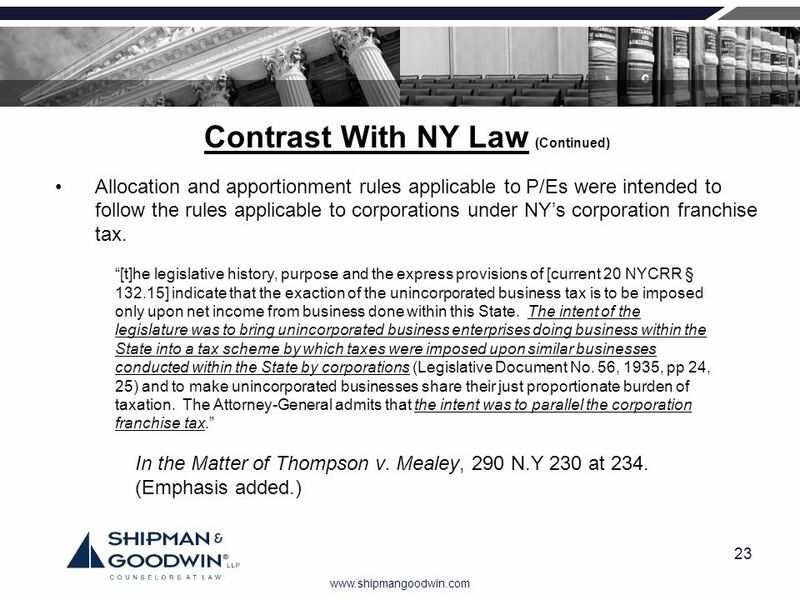 See In the Matter of Piper, Jaffray & Hopwood v. State Tax Commission, 42 A.D. 2d 381 (NY App. Div. 1973). 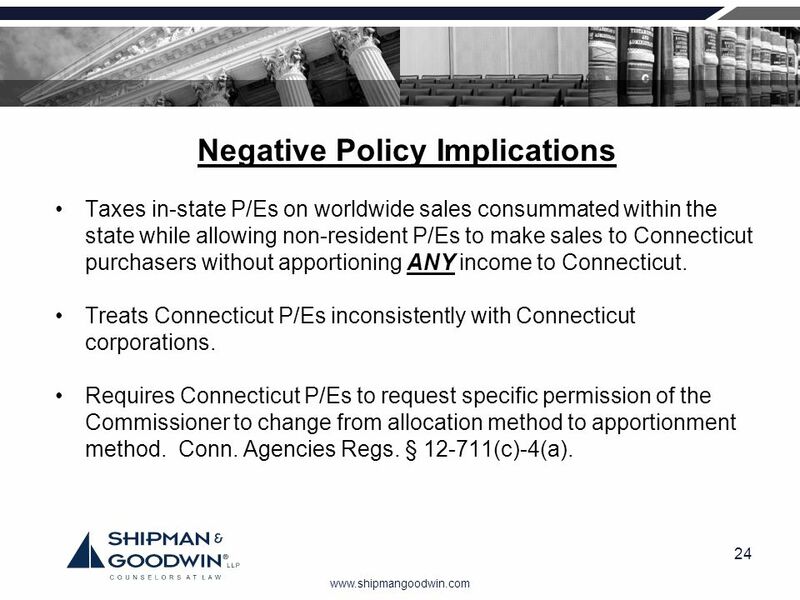 Taxes in-state P/Es on worldwide sales consummated within the state while allowing non-resident P/Es to make sales to Connecticut purchasers without apportioning ANY income to Connecticut. 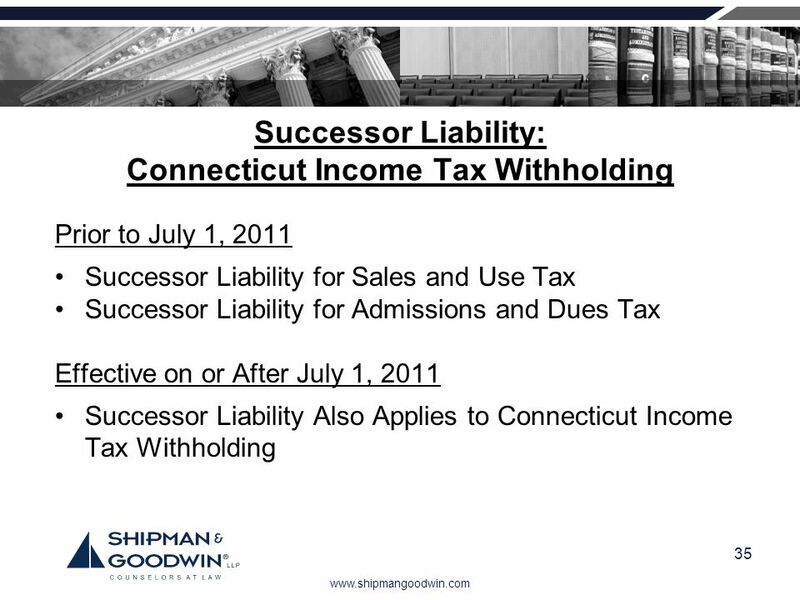 Treats Connecticut P/Es inconsistently with Connecticut corporations. 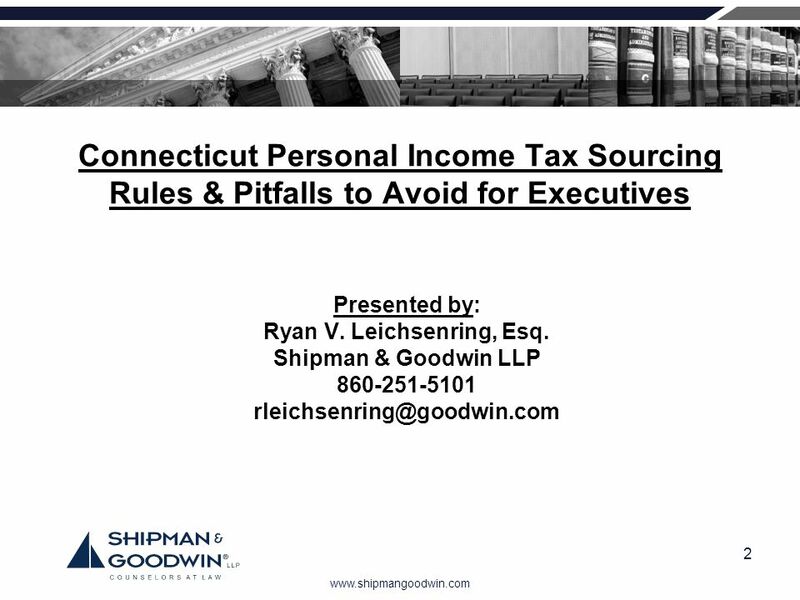 Requires Connecticut P/Es to request specific permission of the Commissioner to change from allocation method to apportionment method. Conn. Agencies Regs. § (c)-4(a). Income Tax audit group -- willing to “make a deal.” Possible legislative fix? 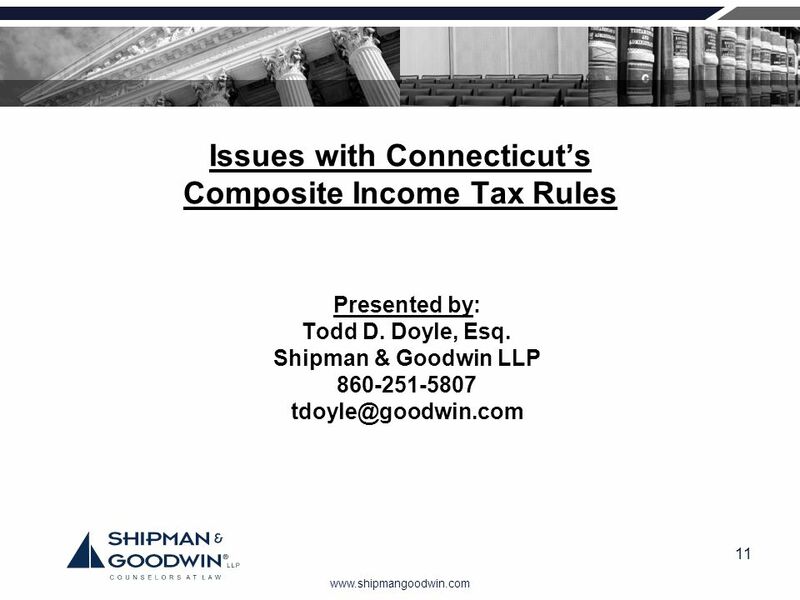 Why is this a Somewhat Complicated Issue in Connecticut? 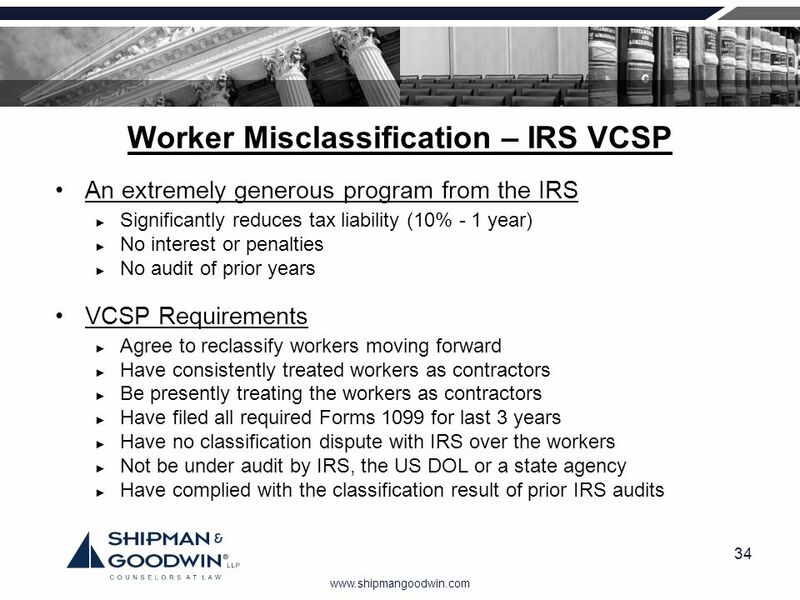 CT Department of Revenue Services (DRS): Follows the IRS regulations and tests for determining a workers status as an employee or independent contractor. 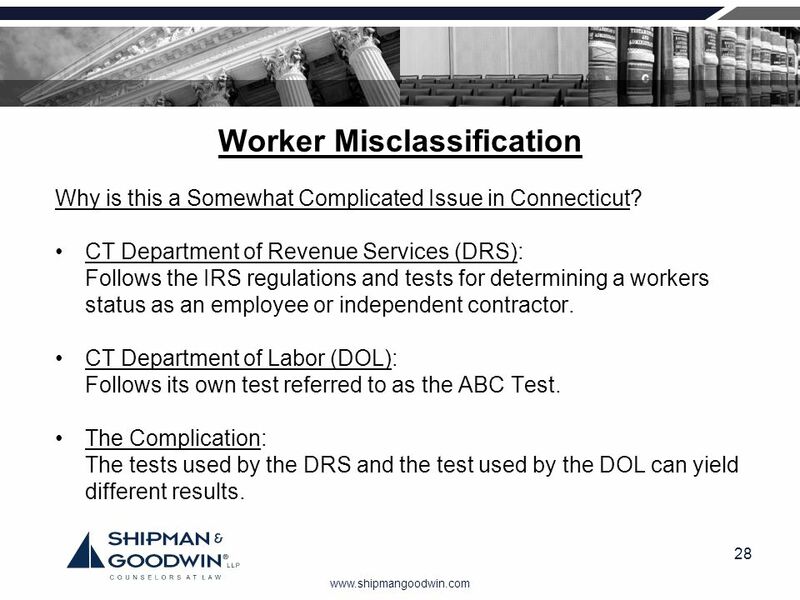 CT Department of Labor (DOL): Follows its own test referred to as the ABC Test. The Complication: The tests used by the DRS and the test used by the DOL can yield different results. 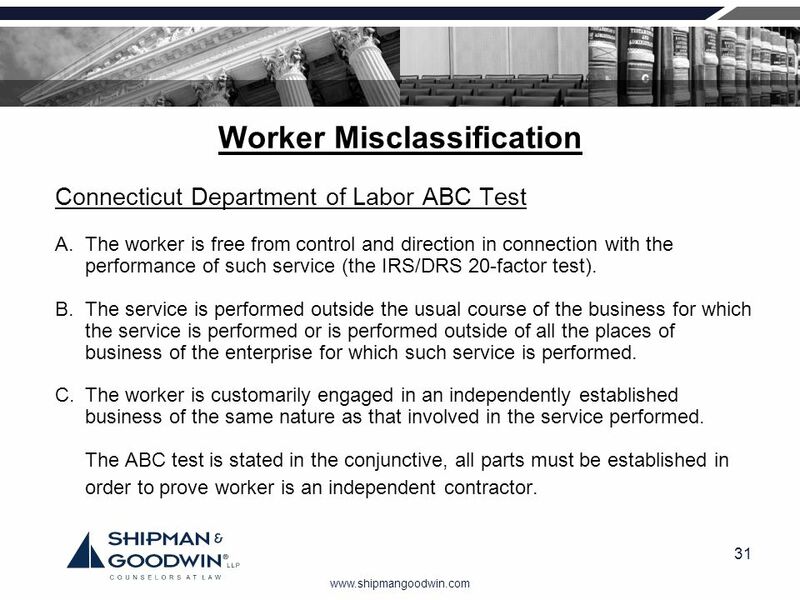 Connecticut Department of Labor ABC Test A. 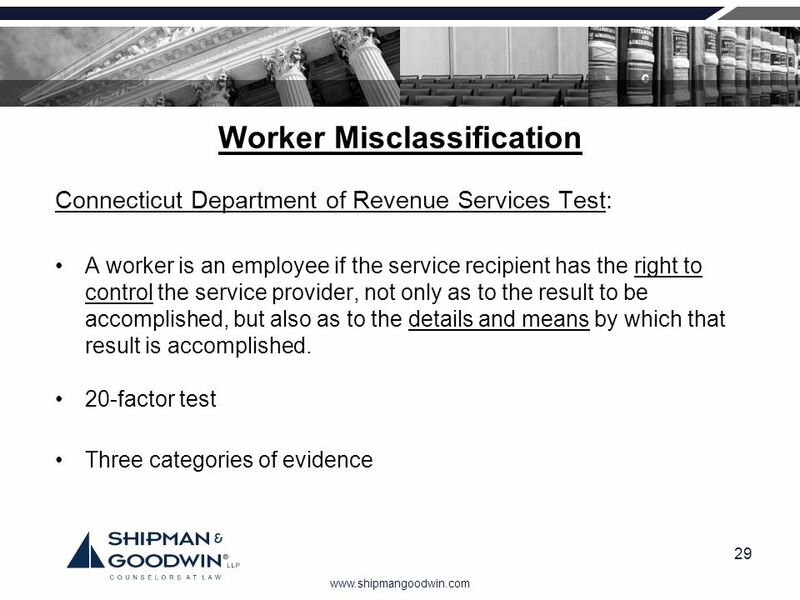 The worker is free from control and direction in connection with the performance of such service (the IRS/DRS 20-factor test). The service is performed outside the usual course of the business for which the service is performed or is performed outside of all the places of business of the enterprise for which such service is performed. The worker is customarily engaged in an independently established business of the same nature as that involved in the service performed. 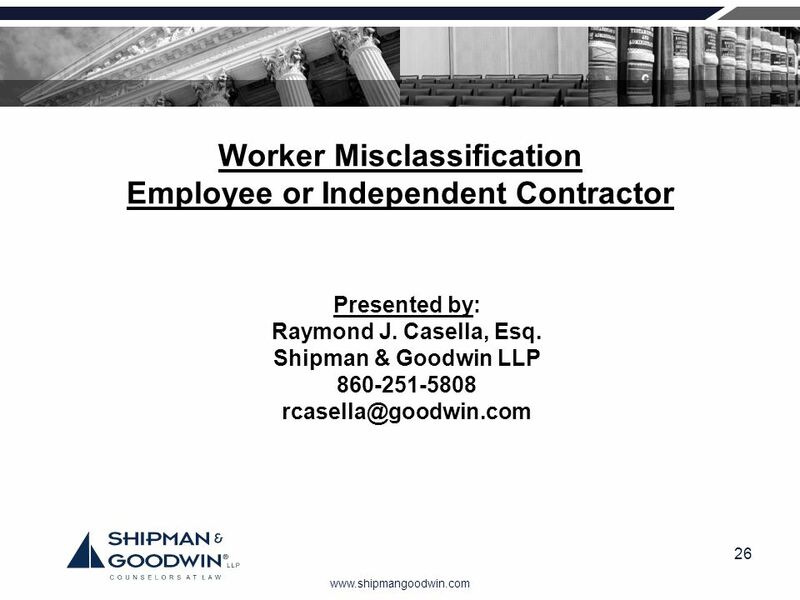 The ABC test is stated in the conjunctive, all parts must be established in order to prove worker is an independent contractor. When it Rains it Pours (a/k/a information sharing)! 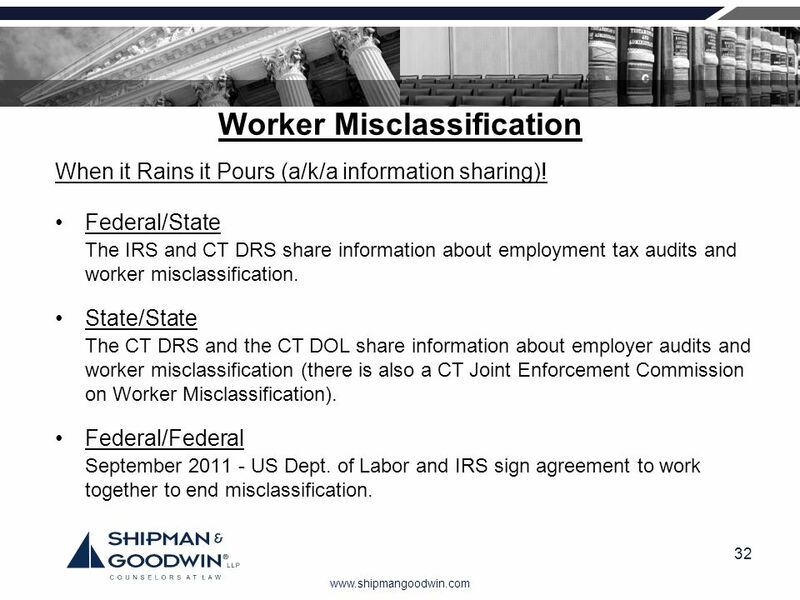 Federal/State The IRS and CT DRS share information about employment tax audits and worker misclassification. 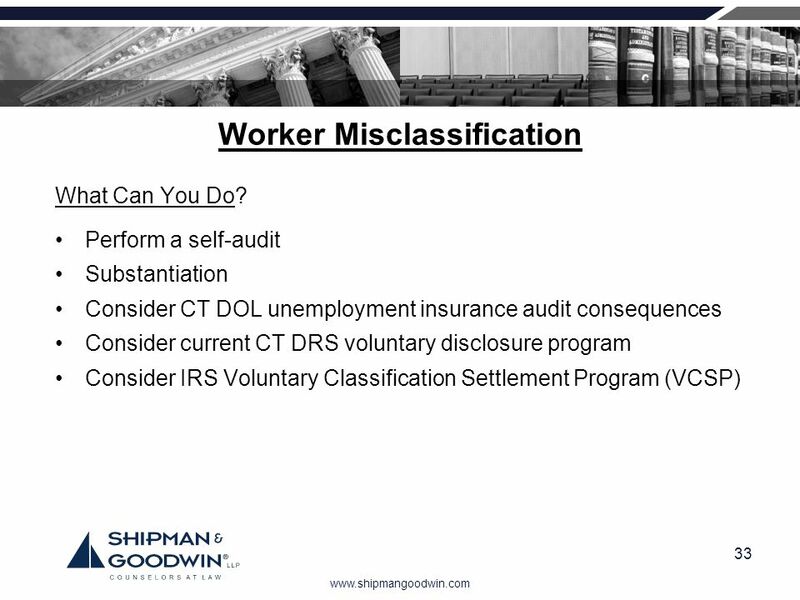 State/State The CT DRS and the CT DOL share information about employer audits and worker misclassification (there is also a CT Joint Enforcement Commission on Worker Misclassification). Federal/Federal September US Dept. of Labor and IRS sign agreement to work together to end misclassification. What is Successor Liability? Successor liability is the obligation of the purchaser of a business or stock of goods to withhold a sufficient amount of the purchase price to cover any sales and use tax liability, admissions and dues tax liability, or income tax withholding liability, plus interest and penalties on such liability, owed and unpaid by the seller as of the time of the sale. How Do You Avoid Successor liability? Request a Tax Clearance Certificate from the DRS. You will receive back a tax clearance certificate or an escrow letter (or a acknowledgement that your request was not accepted because it didn’t contain all the required information). If you receive a tax clearance certificate, you are relieved from liability for your business predecessor's tax. If you receive an escrow letter, you must withhold from the purchase price the amount stated in the escrow letter and pay that amount to the DRS. When Should You Request a Tax Clearance Certificate? As soon as you can (preferable more than 60 days before the closing). If you do not know the exact closing date, include in the request the expected closing date. Once a complete request is received by the DRS, the DRS has 60 days to send a tax clearance certificate or escrow letter. 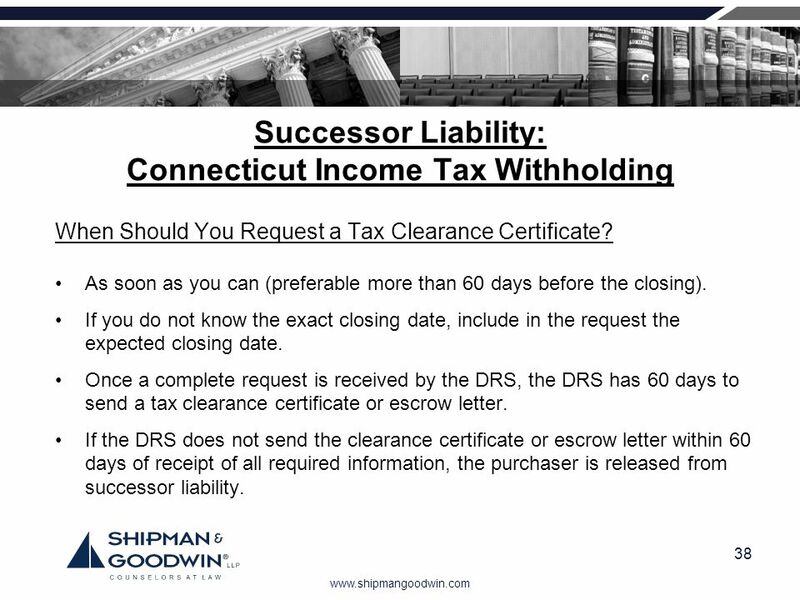 If the DRS does not send the clearance certificate or escrow letter within 60 days of receipt of all required information, the purchaser is released from successor liability. 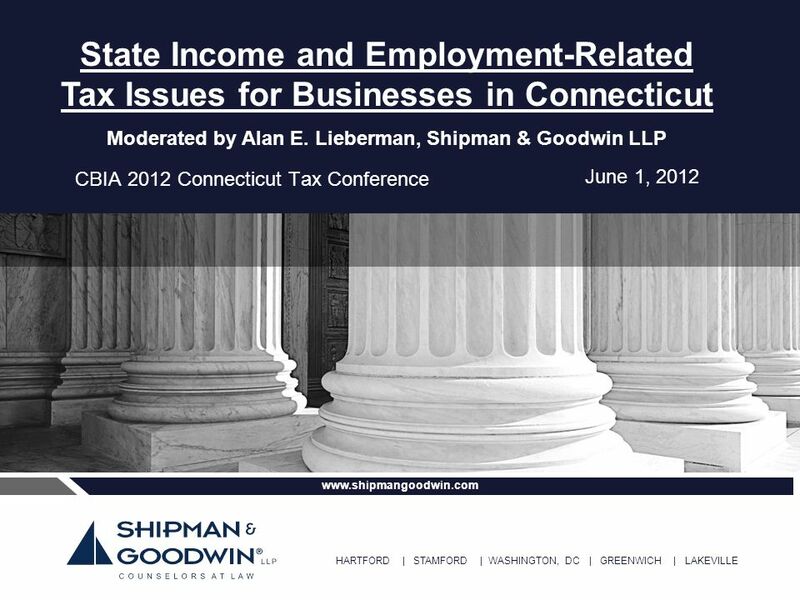 Download ppt "CBIA 2012 Connecticut Tax Conference"
Connecticut Employment Tax Issues CBIAs Connecticut Business Tax Conference May 20, 2011 John Biello Tax Division Chief, Audit Unit Connecticut Department. Irwin/McGraw-Hill ©The McGraw-Hill Companies, Inc., 2000 Principles of Taxation Chapter 9 Sole Proprietorships, Partnerships, and S Corporations.